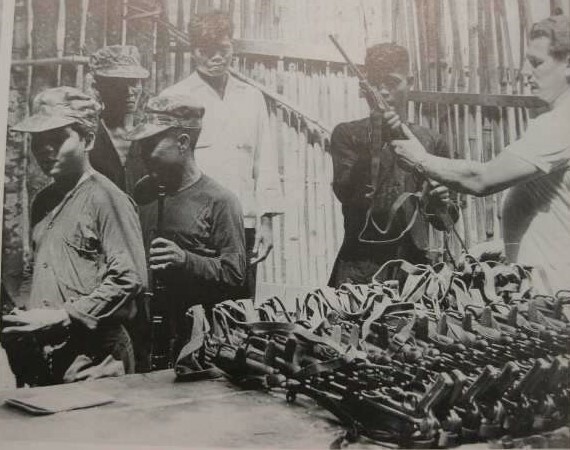 During the Vietnam War, the communists in the north were armed mainly with post-WWII design Soviet weapons, while their opponents in the south used almost exclusively post-WWII American weapons. 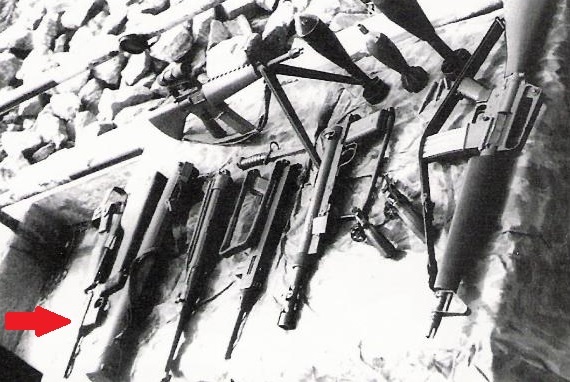 Some old WWII-era Soviet and American weapons were used by the two sides respectively, and to a lesser extent, WWII-era French weapons left over from the Indochina War. There were even a few WWII Japanese guns floating around, left over from the Japanese occupation. The most surprising weapons were WWII German designs, which, through a strange combination of politics and necessity, ended up in combat halfway around the world in Vietnam two decades after their last use in Europe. The 75mm PaK-40 was a standard anti-tank gun of the Wehrmacht during WWII. It weighed 3,142 lbs and fired 75x714mm AP or HE rounds out to a range of about 1,820 yards in the anti-tank role or 4 miles when used as a light howitzer. During WWII, this was an extremely effective anti-tank gun; capable of taking on even the T-34 and M4 Sherman. 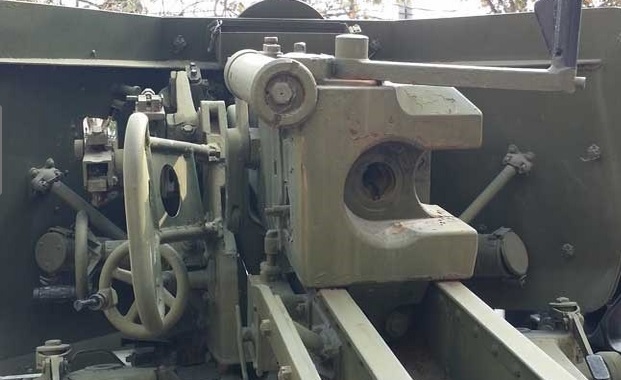 In 1955, the USSR transferred a small number of PaK-40 guns to North Vietnam. They had been captured during WWII and kept is storage for ten years afterwards. They were refurbished before the transfer. 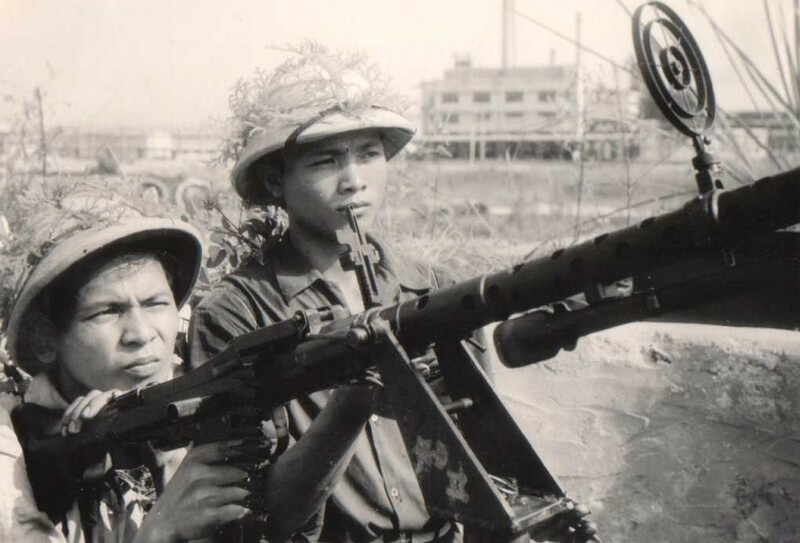 The North Vietnamese did not often employ their PaK-40s in the intended anti-tank role, as they sought to avoid set-piece confrontations with American or South Vietnamese tanks. Additionally, the near-complete air superiority of American warplanes made moving and emplacing towed field guns like this very hazardous. North Vietnam did, however, employ PaK-40 guns in defensive units in the Red River corridor, including coastal defense batteries along the coast of the Gulf of Tonkin. North Vietnam retired the PaK-40 in 1972, so none were in use during the 1975 final conquest of South Vietnam. 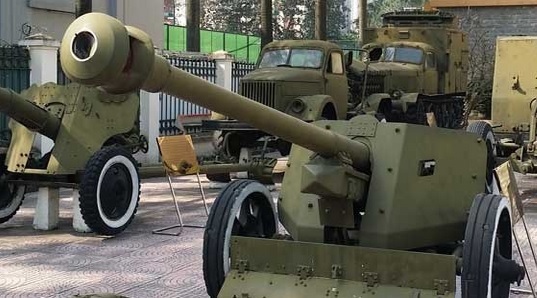 Today, one is preserved at the Vietnam Artillery Museum. This excellent general-purpose machine gun was the predecessor of the much more famous MG-42. The MG-34 was extremely similar to the MG-42 and every bit as effective; the only real reason the latter gun was developed was that the MG-34 was too expensive. The Wehrmacht used the MG-34 throughout WWII, alongside the MG-42. The air-cooled MG-34 fired the 7.92x57mm cartridge from either a 75-round saddle drum or 250-round belts. The North Vietnamese used both methods. It had a rate of fire of 800rpm and was accurate out to about 2,000 yards. It weighed 26 lbs empty. During the Indochina War (1946-1954), the French Foreign Legion had brought a number of ex-Wehrmacht MG-34s into the country, and some of the communist examples could have been leftovers from that conflict. More likely, the MG-34s encountered by Americans during the Vietnam War were part of the initial round of military aid from the USSR which consisted largely of warehoused WWII weapons, both Soviet and German. The MG-34 was ideal for the Viet Cong as it was durable, had a good rate of fire against American helicopters, and was easy to maintain. 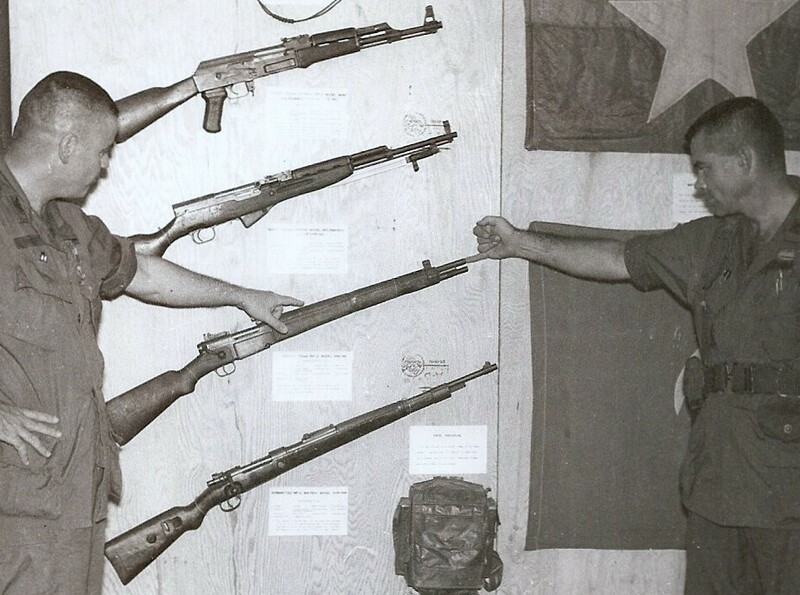 These guns were by no means common, but, were not rare in the Vietnam War’s early phase in the beginning of the 1960s. The MG-34 was gradually phased out as it’s German ammunition supply dwindled, and greater numbers of DShK anti-aircraft machine guns were supplied by the USSR. While the StG-44 was not the world’s “first” assault rifle, it was the first mass-produced on a large scale and issued to wartime units in large numbers. It’s general layout and concept greatly influenced many modern assault rifles which came after it. The Sturmgewehr (literally, “storm rifle” in German but meaning “assault rifle”) was issued to both the Wehrmacht and Waffen-SS in the last phase of WWII. It came too late to help Germany but none the less, was a very lethal weapon. The StG-44 fired the 7.92 Kurz cartridge from a 30-round box magazine. This cartridge had a muzzle velocity of 2,247fps and the gun was accurate out to about 300 yards in full auto or nearly double that in semi-automatic firing. 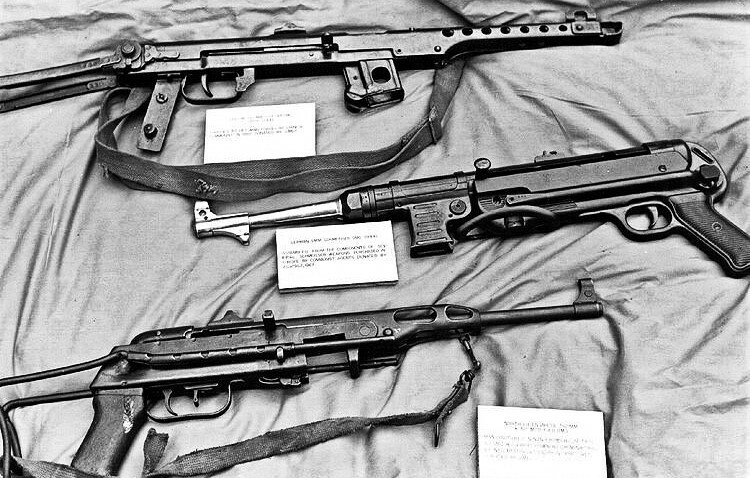 These guns were not as rare as one might imagine after WWII. Despite the relatively small (compared to the 98k rifle) number made before Germany’s surrender, a disproportionate quantity was retained due to the weapon’s modern nature. Tens of thousands were captured by the Soviets in 1945; later in that decade some were transferred to the new client regimes in East Europe, notably East Germany and (especially) Czechoslovakia. By the latter half of the 1950s, these armies had moved on to the SKS and AK-47 and began doling out their StG-44s abroad. North Vietnam’s StG-44s came from at least two sources: the USSR, as part of it’s late-1950s first tranche of military aid; and then a smaller quantity from Czechoslovakia. It’s possible that a very small number were also delivered from East German reserve warehouses in the early 1960s. 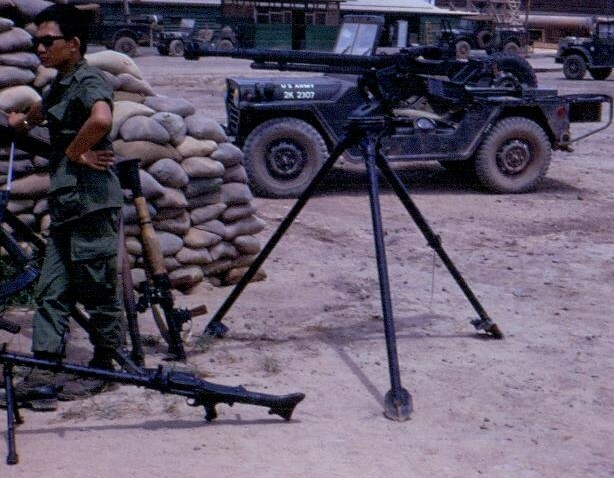 These guns were never “common” but at least very early in the Vietnam War, they were not particularly rare either. 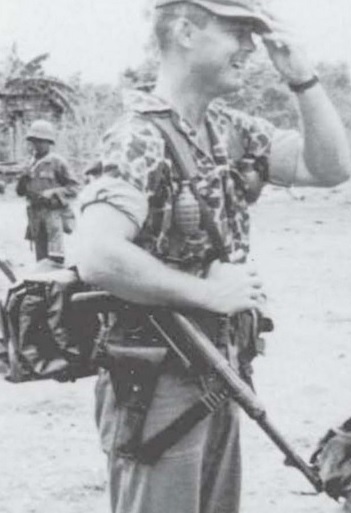 These guns were rarely seen after the January 1968 Tet offensive. 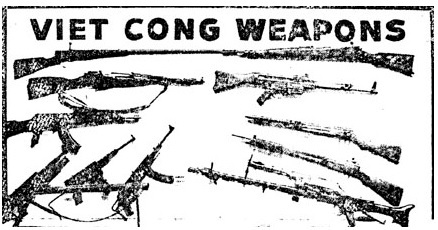 This was almost certainly the most surprising weapon the Americans discovered in North Vietnam’s arsenal. The FG-42 was one of the rarest service rifles of WWII. It was used exclusively by Germany’s Fallschirmjager (paratrooper) units. The FG-42 was intended to equip the Fallschirmjager with a weapon having a machine gun’s firepower, but being as light and small as a rifle. It was, for it’s time, a very advanced weapon. It was one of the few WWII firearms to use plastic furniture (later wood was substituted). It could accept a scope. The FG-42 fired the 7.92x57mm cartridge from a 20-round box magazine horizontal on the left side. The weapon was clever in that the magazine could be ejected and hand-loaded with individual cartridges, or, speed-loaded by running a stripper through the right side of the breech. The center-of-gravity was aligned so that the FG-42 could be shoulder-fired, effectively making it a very early assault rifle. Very few (by best estimate, less than 5,000) FG-42s were ever made during the weapon’s short three-year production run. Fewer still survived the war, and even fewer still were in existence when the Vietnam War started. The number supplied to the Vietnamese communists had to be incredibly small and it’s astonishing that any even ended up in Vietnam at all. Almost certainly, they were supplied by the Soviet Union in the late 1950s. These guns were very rarely encountered in the field. Ironically, the designers of the M60 (the main American light machine gun of the Vietnam War) said they were partially influenced by the layout of the FG-42 when designing the M60 before the conflict. This submachine gun was very common during WWII and along with the stahlhelm helmet, came to “symbolize” the Third Reich on the battlefield. It fired the 9mm Parabellum cartridge from a 32-round box magazine at 500rpm. It’s effective range was low, but as it was intended as a fast-firing, close-in gun, this was not considered important. Tens of thousands of these submachine guns were captured by the Soviets during WWII. 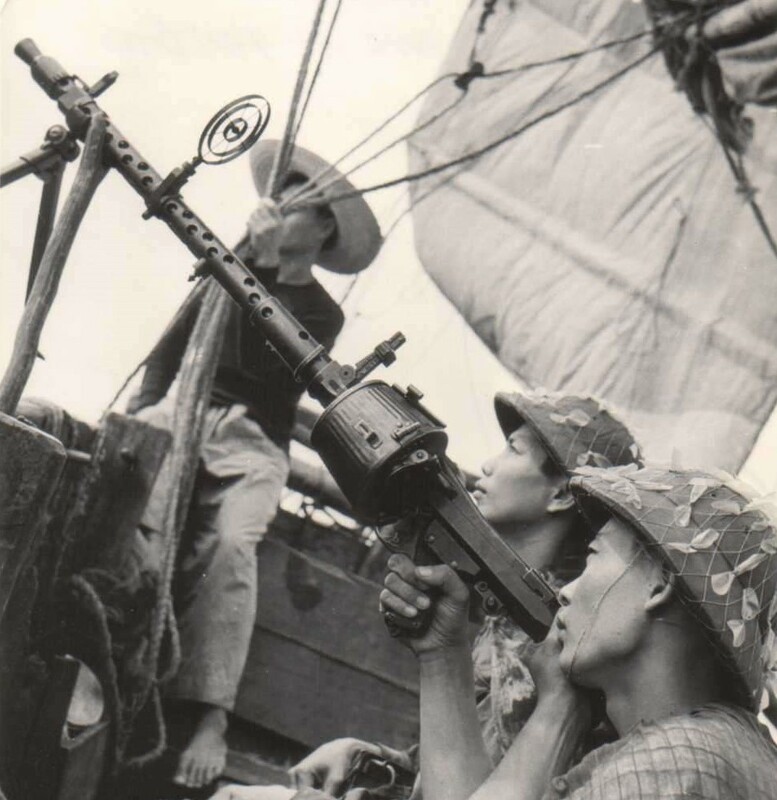 Along with the 98k rifle, they were the most common WWII German firearm encountered by American troops during the Vietnam War. It was also one of the few pieces of WWII German hardware used by both sides. 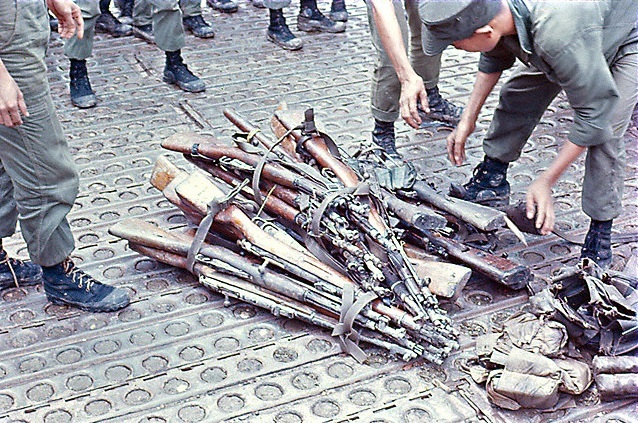 In South Vietnam, most of the MP-40s used by the ARVN (and even in some rare instances, the US Army) were leftovers from a French arsenal overrun by the communists during the Indochina War. In North Vietnam, MP-40s came from the same source and also from shipments of MP-40s captured by the USSR during WWII. The MP-40 remained in use throughout the Vietnam War, although by the late 1960s it had largely been replaced by the AK-47 in communist ranks. Forerunner of the MP-40, a small number of these submachine guns also popped up in the VC’s ranks. They were much less common than the MP-40 and rarely encountered after the mid-1960s. This was the most famous, most used, and most produced (about 14.6 million) German firearm of WWII. It was used in every theatre in Europe from 1939-1945. The bolt-action 98k was 3’7″ long and weighed 9 lbs. It fired the 7.92x57mm cartridge from a stripper-loaded 5-round internal magazine. With the standard open iron sights, it was accurate to about 550 yards and had excellent stopping power. 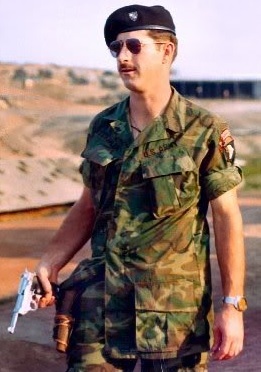 During the war’s early phase, the 98k was fairly common in the VC. These guns came from a number of sources. A small quantity had been shipped to the region by France during the Indochina War and then abandoned there. Some were transferred from Czechoslovakia, and later a small quantity from East Germany, which briefly used ex-Wehrmacht 98ks captured by the Soviets during WWII and then transferred back to the East Germans. 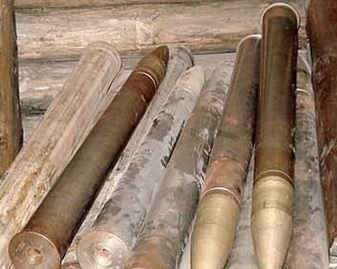 But by far, the largest source for 98ks in the Vietnam War was the late-1950s Soviet arms package. 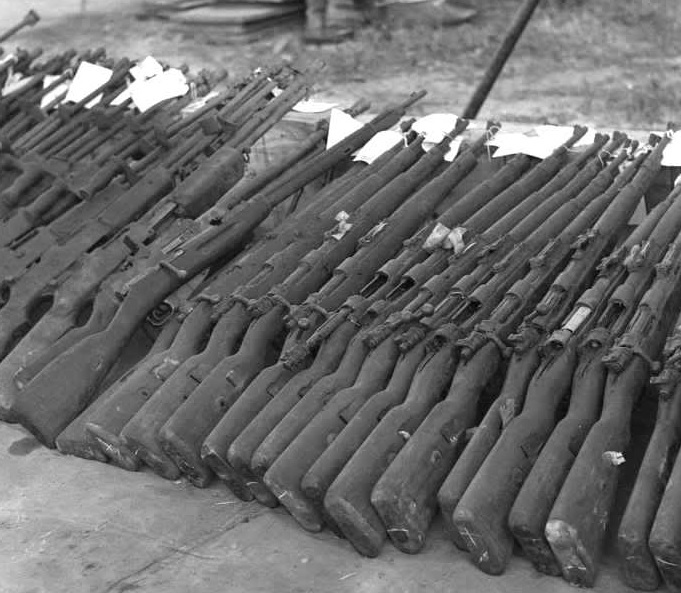 The USSR had captured massive (between 1 to 1.5 million) of these guns in 1945 and actively refurbished them and sent them to communist fighters abroad. The Viet Cong and VPA both used the 98k throughout the Vietnam War, although by the late 1960s it had largely been replaced in VPA service by the SKS and AK-47. Captures of this gun were not at all uncommon to American troops in the early and mid-1960s. As the WWII-era 98k obviously had zero intelligence value by 1960, and was unwanted by either American or South Vietnamese troops, American servicemen were generally allowed to keep captured 98k rifles and legally import them into the USA when their tour of duty ended. 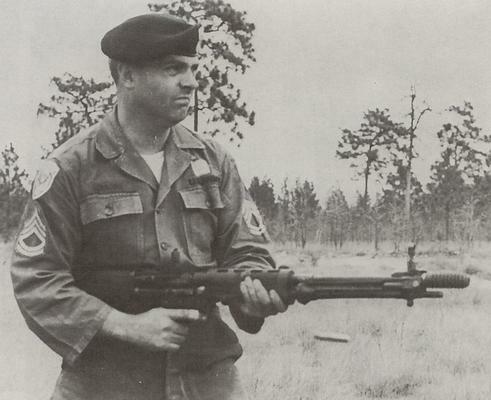 This led to a number of interesting situations where Vietnam-era soldiers captured the same type of rifle as their fathers had captured in WWII from the Germans. A very small number of these handguns were supplied to the North Vietnamese by the USSR in the late 1950s. These were from examples captured from the Germans during WWII. They were not common but did appear from time to time, especially during the early 1960s. This gun fired the 9mm Parabellum cartridge from a 8-round magazine. 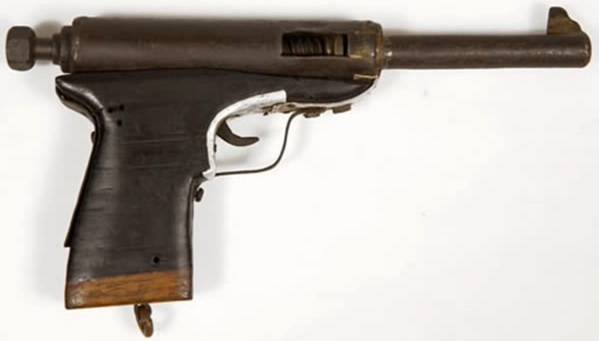 Below is a Viet Cong “zip gun” or “tunnel gun”, a very crude handmade single-shot weapon firing the 9mm Parabellum round, captured from a VC fighter in South Vietnam. It’s maker possibly drew inspiration from the Walther P38. Along with the FG-42, this was another surprising part of the Vietnamese communist inventory. The Mauser C96 was a veteran of not only WWII but WWI as well. It is commonly called “the broomhandle” due to it’s grip shape. Firing the 7.63x25mm Mauser cartridge from a 10-round box magazine, this gun was originally intended as a compact cavalry carbine and came with a detachable shoulder stock which, along with the gun, was designed to fit in a leather carry bag for cavalry troops. For the examples captured during the Vietnam War, all these accessories were usually long since missing and these were used strictly as handguns during the 1960s. The story of how the broomhandle ended up in Vietnam is quite varied. The czarist Russian army had used some, which were then inherited by the Soviet Union; which itself made a sizable buy of this gun in 1920-1921; designated M1920. Further examples were captured from Poland during the joint German/Soviet invasion in 1939. As a non-standard weapon by the 1940s, some of these were transferred to reserve warehouses in the Soviet Far East. The USSR’s participation in the war against Japan lasted only days and was entirely offensive, so the defensive emergency guns were never needed. The July 1953 armistice which ended the Korean War allowed the USSR to undertake an emergency rebuilding of the North Korean army, during which the now long-obsolete Mausers were dumped off to North Korea. The North Koreans did not want them either, and sent some to North Vietnam in the 1960s as a way of indirectly harming the USA. Meanwhile, communist China had produced some clones in 1950 (along with Shanxi Type 17 knockoffs in .45ACP, left over from WWII) and sent some of these to North Vietnam during the war. 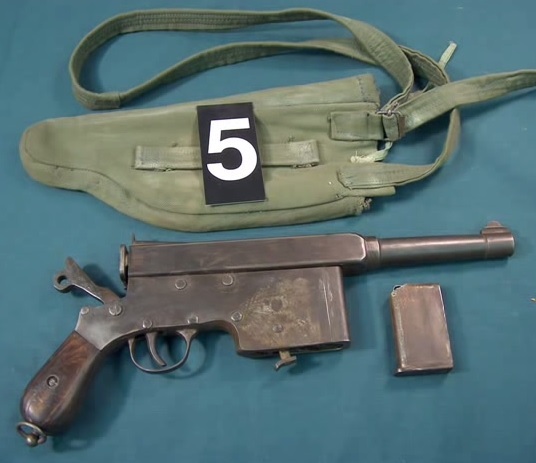 North Vietnam also produced it’s own Mauser-inspired weapon, which never received a formal designation. 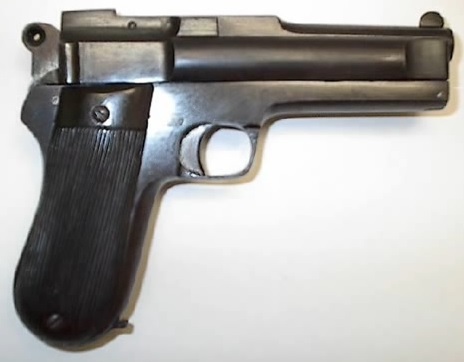 It was true to the Mauser’s operating system but had a different shape to ease production. Finally, to utilize the stockpile of WWII-era 7.63x25mm ammo, a pistol called the Cao Dai 763 was manufactured. The term “Cao Dai” denotes a series of different North Vietnamese handguns, using foreign WWII-era ammunition: 9mm Parabellum, .45ACP, and 7.63x25mm Mauser. These crude guns differ from the homemade “zip guns” in that they were placed into formal production (albeit in small quantities) and were safer to use. Many were made by ripping up railroad tracks from the French colonial era and reusing the high-strength steel. then a postwar SKS, no sks is considered a wartime design and some were used in the last 5 months of the war….. The SKS didn’t start production until 1949; WWII ended in 1945. Isn’t that a Danish Madsen submachine gun, not a S&W 76? Great article! Hi Sandy, no the Madsen SMGs have a squarish receiver body, the S&W (which is a near-clone of the Swedish Gustav) have the rounded look. They all three have the swinging wirestock though. Hi, can I translate it into Vietnamese. It is interesting. By the way, I think these is a typo on MG-34 section. I don’t know any machine gun called “MG-40”. Yes thank you for finding the typo! I have corrected it. Sandy is right, its a Madsen submachine gun not a S&W m76. Hi Bud, look at the shape of the receiver body, it is not a Madsen although they look similar. Yes you have convinced me now. Thank you for the catch and I will correct! In the pic showing the Mauser C-96, the fourth gun (after the MP-40) is a Madsen SMG. A question for you, if the STG-44 was not the first “Assault rifle” then what was? LOL That is a good question, and one which has long been debated. I’m with you in that the StG was, others put the pre-WWII Federov Avtomat or even the WWI Chauchat which I would consider more of a very light squad machine gun. I did not know about the Federov, but I can see why this is debatable. However since it was prone to overheating and manufactured in limited numbers I think I will side with the StG 44 as the first Assault Rifle. I also always believed that the AK was modeled/copied from the design of the StG. Thanks again for the excellent article. Chad. Cao dai is a religious sect in the west of south vietnam, towards the cambodian border. They were both anti-french and anti-communist. They are known to manufacture arms, in small quantities. Very interesting article–only knew about some of these WW2 weapons finding their way into the Vietnam war. Outstanding read and photos to accompany. 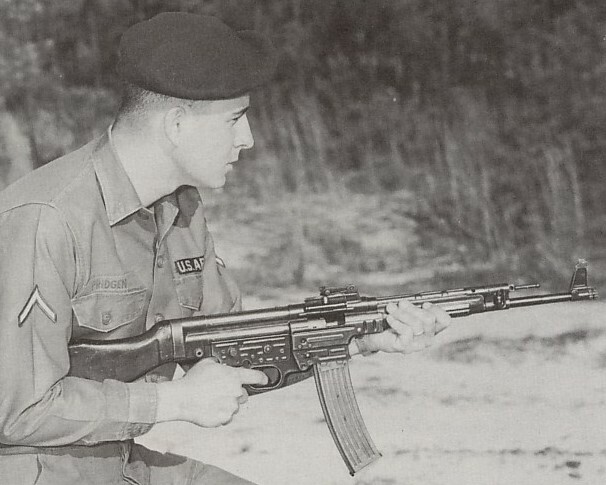 Have you ever come across any photos of the G/K43 semiautomatic rifle in Vietnam? Nice article! The 20 round mag in the K98 is from an MG13. Very interesting bit of history, thanks for writing it down. Landed here via the Wiki article of the FG42. I think it’s also possible that these guns, being rare and expensive, were leftovers by ex-nazi-paratrooper french foreign legionnaires (ffl) from the Indochina war, like the famous battle at Dien Bien Phu. Quite a few Nazi paratroopers preferred to join the french foreign legion and maintain their elite soldier status to living in defeated Germany as civilians and rebuild their country. In the years after WWII, up to 50% of the candidates applying to the FFL were German. 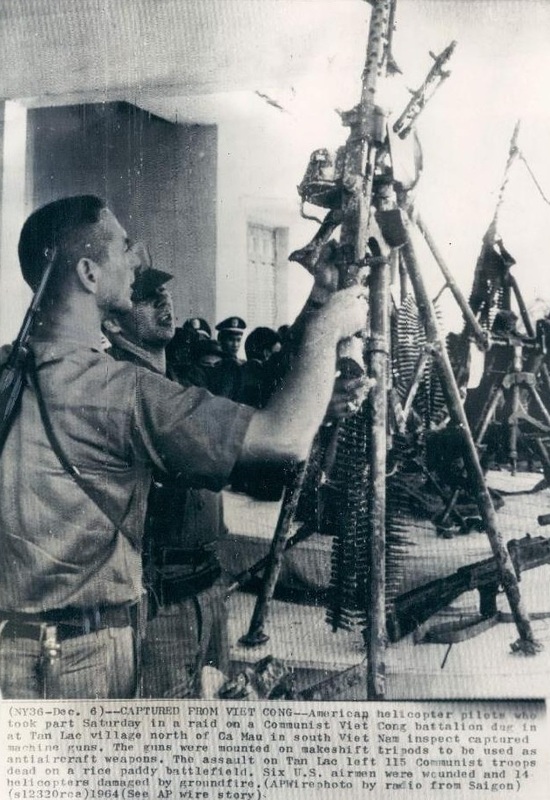 It’s probably unlikely that they could choose their gear, but I find it just as unlikely that the soviets would make the effort and give these guns to the vietcong. How can I tell if my pourtaguese contract 1937 was used in Vietnam? 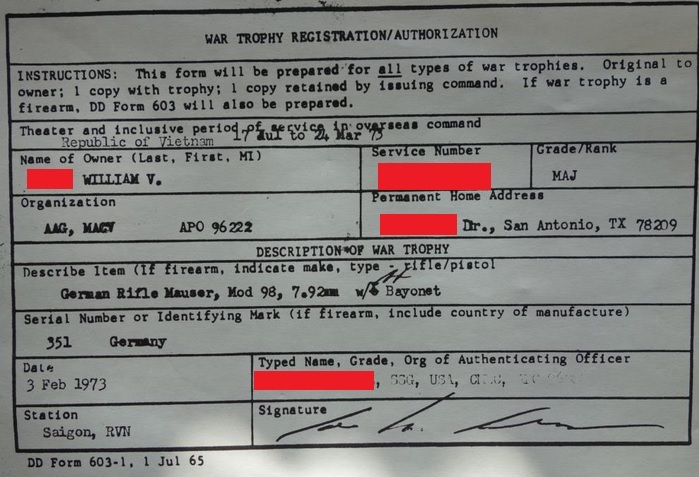 Its marked with munich shield and a 72. The bayonet lug was removed and a rubber end cap that fits perfect. It would be hard to prove. One thing to look for is the postwar Soviet stamp (a pair of crossed sabres; often which look like a X as the dies were worn). Another would be a star stamp on the receiver which was the post-WWII French army symbol of accepted ex-German arms. If it doesn’t have one or the other, it almost certainly was never in Vietnam. As soon as Major General Andrew Anderson finds the papers ill be good to go. I have niether mark in my rifle. He was in the 25th lightning division in Vietnam.